He's gone and done it again. After finishing second behind team-mate Esapekka Lappi at the opening round of the Asia Pacific Rally Championship at Whangarei, Gaurav Gill's managed to get on the podium for the second time this season and it's the top step of the podium, no less. That's right Gill and co-driver Glenn Macneall won Round 2 of the APRC at New Caledonia, a particularly tough rally given that the roads were wet thanks to a heavy rainfall. Here's how he did it. 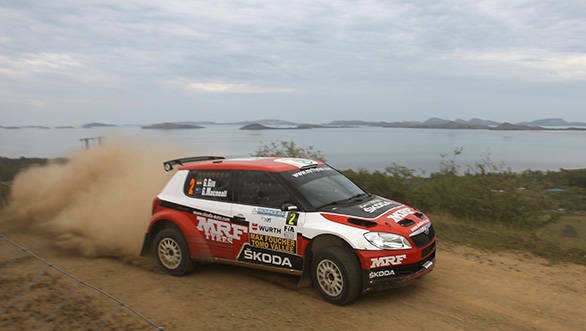 On Day 1 of the rally, Gill managed to win the first two stages, giving him a 12 second advantage over team-mate Lappi. On the third stage, which is tight and twisty with several hairpins, Gill lost control of the car and had a half spin. This cost the Indian driver 30 seconds, which meant Lappi had a 20 second time advantage over Gill. Towards the end of the day, it was Lappi's turn to make a mistake. The Finnish driver ran wide and crashed into a rock, damaging the Skoda Fabia S2000 he was piloting. This put Gill back into the lead of the rally. Adding to his 12 minute overall lead at the end of Day 1 was a sense of comfort that came from the knowledge that four of the APRC's top contenders were out of contention after crashing out. While the team planned on sending Lappi out on Day 2, they weren't able to repair his car in time. Gill, then, just had to keep calm and win the rally. So heavy had been the rain overnight, that five of the high-speed stages had been cancelled. There was only one stage that could be used - and it was used three times. Gill came, saw and conquered. "It was a perfect weekend for me" said Gill "the technical problems we had with the car in New Zealand resurfaced on shakedown but fortunately Lane Heenan, (Race Torque Engineering), and his mechanic's found the problem so I was able to drive with confidence"
Gill also declared "The Skodas were spot on all weekend and this makes a difference because you can concentrate on your driving." Finishing in second place was Sanjay Takale, co-driven by Sean Gregory, in a Subaru Impreza WRX STI. Simon Knowles and Margot Knowles finished third in their Mitsubishi Lancer Evo. The next round of the APRC is in Queensland between the 13th and 14th of July.